One source of cheer to me is that my muse for OpenQuest has returned. I think I scared it away with big unrealistic plans post release of the book, and the seemingly never ending typo hunt end of 2009 that lasted until July’s Final edition last year. At the beginning of this year I was of the opinion that I was going to let it quietly die off and move onto other projects and let other people carry the torch. I said as much to a publisher friend and my muse must have heard me. The other day it came back with a vengence and I’ve been quite happily writing an adventure (which is what I like doing best alongside light supporting backgrounds) for OpenQuest with numerous ideas for more! Safe to say you’ll see more Adventure packs, either as quick straight to PDF mini-releases or shorter Print books, from me. So that’s me getting over myself. Meanwhile author Nathan Baron is putting on the finishing touches of Empires Rising. 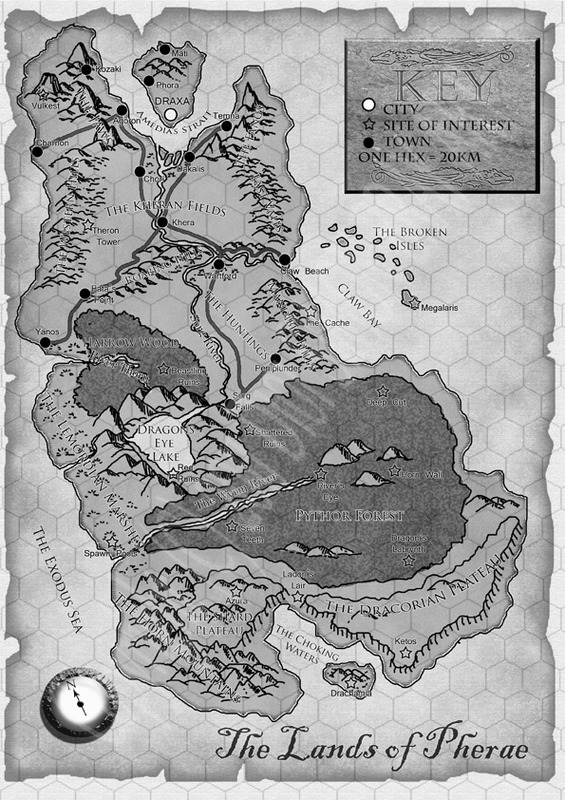 Here’s the map of the setting by Simon. That’s a gorgeous map! Can’t wait to see the rest of the book. It looks like it’ll fit right in to the BRP Fantasy setting I’ve been working on (a vast archipelago, sort of inspired by the Earthsea books). That map looks brilliant! I suspect that “Here Be Dragons” will be right up my alley. OpenQuest deserves a hell of a lot more attention. It is a great frame to build upon. Solid, sturdy and nothing fancy, but that is the beauty of the system. Function over fancy, if you will. My love for OQ continues to grow. It is a wonderful game system put together by a bunch of great guys. Please keep it going!